A fully functional HUD that you can use to do nearly everything fennux-related in-world! Keep your Fennux hydrated at least twice per 5 days to ensure the best breeding outcomes. Also known as the Redelivery Portal, this object can bring back lost Fennux in a couple of clicks. Ever wanted to show off your Fennux in-world on a single prim? Now you can! Oh, and it's free. Merge all of your recipes at once! This will DELETE your recipes, but gives you FNX Points in return. Are you a professional sculptor in SL? Seriously, pros only, it's a little difficult. Make attachments for Fennux! Know how to script/create stuff? Maybe you might fancy yourself making some third-party items that interact with Fennux? A home that can have up to 8 Fennux linked up at a time. A home that can have up to 8 Fennux linked up at a time and keeps them auto-hydrated. Feeds 1 Fennux for 1 Day, you can buy as many as you want! An arena that can duel 2 different Fennux at once. Instantly heals 1 of your sick Fennux. Allows you to duel any Fennux against the NPC Fennux for solo-dueling. 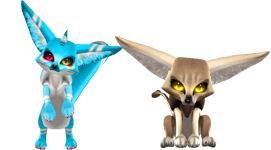 Stops the Fennux from eating kibble so you can keep it forever, but allows for no more breeding!